Could it be? 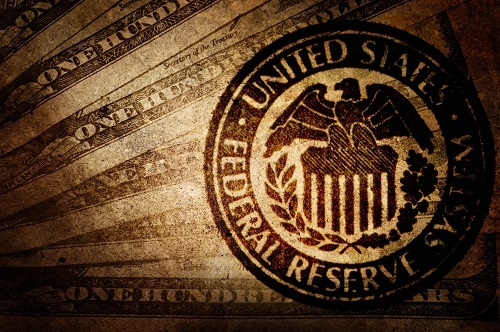 Is the official fed funds interest rate stuck at the paltry 1.00-1.25% level? According to one well-respected Wall Street firm, the answer may be yes. Continued soft wage gains in the latest jobs report, along with subdued inflation data give the Fed a reason to hit the pause button on any more interest rates hikes this year, says S&P Global Ratings. If you haven't gotten a raise in a while, you aren't alone. Wage growth has been exceedingly soft in the years following the 2008 global financial crisis. That's not normal. In a typical economic cycle, as the economy adds jobs and the labor market becomes tighter, employers must compete for good workers and raise pay levels. We haven't seen that trend this time around, notes the economists at S&P Global. S&P Global now expects the Fed to announce its balance sheet reduction (a form of policy tightening in and of itself), and then stand pat on any further interest rate increases this year. That's bullish for gold. In the meantime, the Dow made history last week as it crossed the 22,000 mark. Andrew Karolyi, professor of asset management and finance at Cornell SC Johnson College of Business, warns of headwinds for the stock market ahead. “Another milestone for the Dow means another chance to ask the hard questions about fundamentals that might justify it," Cornell's Karyoli says. “There are serious headwinds, including fiscal policy uncertainty (tax reform, infrastructure), political stasis, turbulence in international trade and investment relationships, and many geo-political risks," Karyoli warns. “A 22,000 point Dow may be just the prompt investors need to book a sit-down with their financial advisors for that regular financial health checkup," Karyoli concludes. Here's something else to consider. The stock market is heading into its seasonally bearish time – late August through October. "Investors might be better off adopting a dose of caution to their optimism during this traditionally challenging period of the year by reminding themselves not to go too far out on the risk curve," says Sam Stovall, chief investment strategist at CFRA. Is Your Portfolio Properly Protected? You may be more concerned with vacations this time of year, than your portfolio. However, we urge you to take the time to analyze your allocations and if needed buy some additional protection. Gold typically rises and often dramatically during stock market corrections. Current levels in gold offer a great buying opportunity. Take the time now to beef up your portfolio protection, with a greater allocation to physical gold and silver. Rare coins offer the opportunity for even greater price appreciation. Learn more about the right time to buy "insurance" here.